This 120 m², 2-bedroom apartment in Lemonnier offers 2 ensuite rooms for rent and has stylish industrial décor. The modern open plan kitchen and living area is beautifully presented and offers a dishwasher, television, sofa and a dining table. 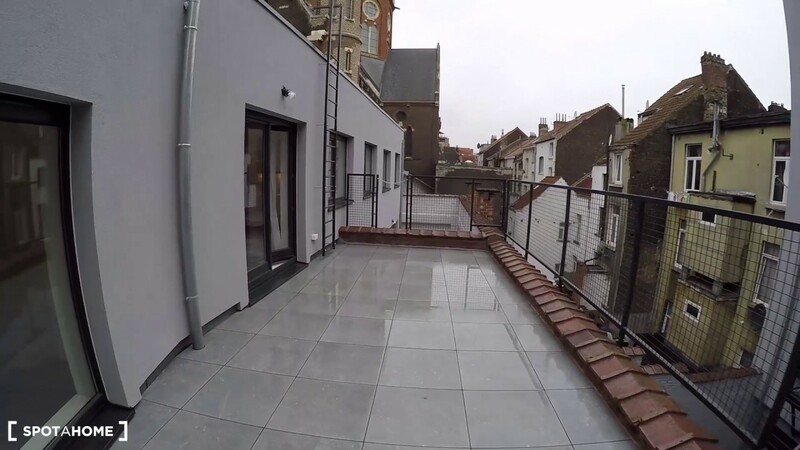 The apartment has a convenient location in Brussels City Center within a 12-minute walk of the Grand Place. As you can expect from this central location you will find public transport as well as numerous restaurants, bars and shops nearby. The apartment has been recently renovated to a high standard. There are windows on both sides of the living room that let in plenty of natural light. The terrace offers lovely views and is equipped with a table and 2 chairs. Each room has an ensuite bathroom and there is a separate toilet room for guests. Tenants will also have access to the building's communal living area which will be a great place to meet your neighbours. The apartment is within walking distance of many of the city's attractions. The apartment is in the city center but has double glazed windows that insulate street noise. There is a washing machine in the apartment but the dryer is in a common laundry room. Bodegem tram station is a 4-minute walk from the apartment and serves lines 51 and 82. Anneessens tram station is a 3-minute walk from the apartment and serves lines 2, 4 and 32.